Performers include: Jeremy Piven, Amanda Abbington, Gregory Fitoussi, Tom Goodman-Hill, Trystan Gravelle, Katherine Kelly, Aisling Loftus, Aidan McArdle, Frances O’Connor, and Zoë Wanamaker. This period drama TV show revolves around starry-eyed American retail magnate Harry Selfridge (Jeremy Piven). He sees diamond-like possibilities on the rough end of Oxford Street in 1908 London. Fresh from years of success with Marshall-Field’s department store in his native Chicago, the high-stakes entrepreneur invests heavily in creating the department store of his outsized dreams. He bases Selfridges on the belief that he can change the way England shops, but there’s more in store for Selfridges than fanfare. Behind the celebrated window displays and thrilling publicity stunts, the man’s heart is torn between loyalties: First, to his placid wife, Rose (France O’Connor), and next to an ardent infatuation with the dazzling showgirl Ellen Love (Zoe Tapper). Mounting debt requires him to play a financial snake charmer, as well. It’s becoming clear that even while Selfridge is always selling with an infectious grandiosity, not everyone is buying his act. Further still behind the seams, Selfridges employees grapple with their own problems. Perpetually cautious Agnes (Aisling Loftus) hides the abuses of a drunken father, while skirting the advances of the arduous waiter Victor (Trystan Gravelle). The brilliant window designer Henri LeClair (Grégory Fitoussi) joins the triangle, one of many in a department store that never sleeps … at least not alone. In the series finale, Harry bets his last chip on a desperate plea to his suppliers, but he finds there is sometimes no going back. Even in the darkest of times, the show must go on, and with a faithful staff by his side, London’s king of retail may manage to have the last word. First aired: May 22, 2016. What do you think? 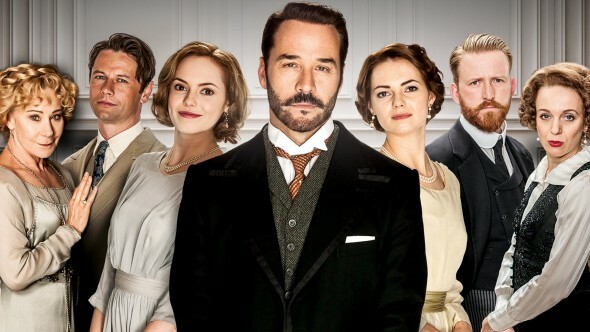 Do you like the Mr. Selfridge TV show? Do you think it should have been renewed for a fifth season? Loved this series. The show was a delight, no bad language, gratuitous inuindo, filming quality was wonderful. I enjoyed The Paradise also which was similar and equally good. Downton Abbey too. Love all this type of tv. So sorry to hear that the show is canceled. Really enjoyed it & was looking forward to more seasons. This by far is a fantastic series and I feel it should run for as long as possible, in my humble opinion it triumphs Downtown Abby. Mr. Selfridge has breath taking sets and costumes so true to the period and with actors that are true to character. I think it should be renewed for a fifth season and I also think it should have it’s very first Christmas special. Love the series & do not want it to end.